Immune checkpoint inhibitors (CPIs) are monoclonal antibodies that target inhibitory receptors expressed on T cells, and have recently been used in treating solid organ and hematologic malignancies. In the September 2016 issue of Kidney International, Cortazar and colleagues describe the clinical and histologic features of 13 patients with CPI-induced acute kidney injury (AKI) who underwent kidney biopsy. 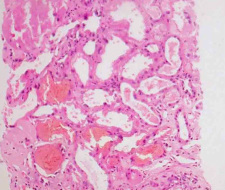 The prevalent pathologic lesion was acute tubulointerstitial nephritis in 12 patients, with 3 having granulomatous features, and 1 thrombotic microangiopathy. Among the 12 patients with acute tubulointerstitial nephritis, 10 received treatment with glucocorticoids, resulting in complete or partial improvement in renal function in 2 and 7 patients, respectively. The authors propose that CPI-induced AKI is a new entity that presents with clinical and histologic features similar to other causes of drug-induced acute tubulointerstitial nephritis, though with a longer latency period. Glucocorticoids appear to be a potentially effective treatment strategy. Hence, AKI due to CPIs may be caused by a unique mechanism of action linked to reprogramming of the immune system, leading to loss of tolerance. The 3rd International Renal Pathology Conference (IRPC) will be held al the All India Institute of Medical Sciences in New Delhi, India from February 10-12, 2017. This is much awaited event held biennially. The registrations are now open through the conference website www.irpc2017.com. The conference also includes a competitive poster session and a rich scientific program. The speaker list features leaders in the fields of Nephropathology & Nephrology. Early registration is encouraged to avail discounted registration fee. September 2016 issue of AJKD has published a comprehensive core curriculum on Pathophysiology of Renal tubular acidosis. A must read for everyone! An interesting multi center observational study from Ireland published in the August issue of cJASN has highlighted the temporal and spatial clustering of biopsy proven anti GBM disease cases, suggesting and further emphasizing a long suspected environmental trigger in pathogenesis of this disease. AJKD Atlas of Renal Pathology in August features the extremely informative case based discussion on HIV associated nephropathy (HIVAN) with excellent teaching images and succinct review of clinical and Pathologic features. An extremely informative case based review of Kalopenic or Hypokalemic nephropathy is featured in August issue of the Clinical Kideny Journal and is available as an open access article. The article re emphasizes the various clinical associations and provides good overview of salient pathologic features of this entity. Also see the case discussed earlier in this website. Sethi et. al have described a novel entity of C4 glomerulopathy in a short series of three cases where a proliferative glomerular morphology was associated with absence of glomerular C3 staining but bright staining for C4d along the glomerular capillaries. This has further been divided into C4 glomerulonephritis (bright C4d staining and predominantly mesangial electron dense deposits by EM) and C4 Dense Deposit Disease (bright C4d staining and dense deposits along glomerular basement membranes in EM). In the March 2016 issue of AJKD, Sethi et. al. have also described an interesting case report of proliferative C4 Dense Deposit Disease associated with thrombotic microangiopathy, monoclonal gammopathy and Acute kidney failure. Phil Halloran & colleagues in the March 2016 issue of Am J of Transplantation describe the subphenotypes of AMBR and their molecular characteristics. Authors used the features of microcirculatory inflammation ( glomerulitis & /or peritubular capillaritis; pg lesions) and capillary wall double contours (cg lesions) to explore subphenotypes in 164 indication biopsies with ABMR-related diagnoses: 137 ABMR (109 pure and 28 mixed with T cell–mediated rejection [TCMR]) and 27 transplant glomerulopathy (TG), identified from prospective multicenter studies. The lesions indicated three ABMR subphenotypes: pgABMR, cgABMR, and pgcgABMR. The pgABMR subphenotype presented earliest (median <2 years), frequently mixed with TCMR, and was most associated with nonadherence. Subphenotypes differed in their molecular changes, with pgABMR having the most histologic–molecular discrepancies (i.e. potential errors). The authors conclude that ABMR presents with distinct subphenotypes, early pg-dominant, late cg-dominant, and combined pgcg phenotype, differing in time, molecular features, accompanying TCMR, HLA antibody, and probability of nonadherence. JASN featured an article by Sethi et. al describing the utility of glomerular C4d staining as a diagnostic tool in refining the diagnosis in immune complex mediated proliferative glomerulopathies. Authors base their approach on the proposed Mayo classification of MPGN; a etio-pathogenesis based classification which relies mainly on DIF findings, and distinguishes proliferative GN's into immune complex mediated and complement mediated disease processes. The study involved analysis of glomerular C4d staining in 30 biopsy specimen of C3 glomerulopathy (25 C3 GN and 5 dense deposit disease), 18 cases of various immune complex GN's and 13 specimen of post infectious GN. Almost all (27/30) cases of immune complex mediated GN (except one sclerosing MPGN and two cases of IgA nephropathy) showed significant staining for C4d. Among the C3 GN cases, 24 (80%) were negative for C4d and six showed trace/1+ staining intensity. In PIGN group six (46%) cases were negative and seven (54%) cases showed positive glomerular immunostaining for C4d. Authors conclude that C4d is a useful positive marker for immune mediated (and lectin mediated) GN which involve activation of classical complement cascade. In contrast the glomerulopathies mediated by alternative complement pathway like C3 GN are almost invariably negative for C4d.This approach further refines the diagnostic armamentarium and diagnostic approach to the proliferative glomerulopathies. data! The authors envisage an integrated Genomics- Histopathology-Clinical approach which would be the key to understanding critical issues in nephrology and renal transplantation in particular. Readers are also referred to an intersting study by Prof. Phil Halloran's group earlier this year and an equally interesting editorial by Prof. Randhawa discussed earlier in this forum. Another article on the renal " Histogenomics" by Perco & Oberbauer focusing on renal transplantation also provides a good overview of this exciting new area of targeted high throughput research. Arthritis and Rheumatism has published the accepted version of the new revised (2012) international Chapel Hill Consensus Conference Nomenclature for vasculitides. A nice review article on structure and functions of Glomerular filtration Barrier by Menon MC, Chuang PY, and He CJ, appeared in Journal of Nephrology some time back. This well referenced review provides a concise and crisp overview of the various components of the filtration barrier and their mutual "crosstalk" . A must read for updating our current concepts in this vital area! Other relatively recent and informative articles by Levidiotis & Power and Jarad & Miner may also be read for a comprehensive review on this topic. While renal biposy is the gold standard for diagnosis and framing of management strategy in LN, the non-incorporation of tubulointerstitial and vascular components in ISN/RPS classification has always limited its utility. As shown by some studies in patients with LN (Yu et.al) and also from the Oxford classification of IgA nephropathy, tubulointerstital alterations are important determinants of long term outcome in primary glomerular diseases.Few recent articles emphasizing the role of renal biposy in LN, which also discuss the future prospects of the current classification and its clinical implications by Giannico & Fogo (cJASN) and Biehl, Petri & Fine (KI) should also be read for current overview of this topic. 2. Availability of meeting abstracts was poor, ranging from 0 to 37% (P < 0.01) with ISI Web of Knowledge containing the largest proportion. 3. Among the subscription-free databases,free access to full-text articles was highest in Google Scholar. 4. About 40% of full-text journal articles could be accessed freely through links provided by the subscription-free databases. 5. Among subscription free dtabases, free access to full-text articles increased from 20 to 49% for articles published before 1980 compared with articles published in 2000 or later.This may be of particular interest to clinicians & researchers in settings with limited access to subscription-based resources. This is perhaps one of the more neglected and and under recognized topics in renal pathology. However, a closer look at the number of people living at risk of renal complications of parasitic infections is astounding! Interestingly, renal involvement occurs in only 20 of the 342 parasitic infections known to affect humans, and among these plasmodia, schistosomes, filariae and leishmaniasis from the vast majority of cases. The current issue of AJKD highlights a (freely accesible) comprehensive review on this topic which traces the origin of detection of parasitic diseases to the recognition of their potential to affect the kidneys and summarizes current status of our knowledge in this area. A brilliant and must read article!! The last decade has seen a substantial increase in publications advocating the use of various biomarkers in patients with AKI. A closer look at the various papers gives some hints why the promise seen at the basic research level has not translated well at the bedside!The reasons are manifold and are beautifully discussed in this comprehensive & in depth review of literature and critical evaluation by Vanmassenhove et. al, published in recent issue of NDT. This article presents a detailed analysis of 87 papers based on 74 different studies indexed in Medline till April 2012 and concludes that early diagnosis of AKI in clincal setting is rather cumbersome using these novel biomarkes, which are specially unsuitable in cases where the etiology and timing of AKI are not certain or are unknown. A must read for anyone planning a new study on urinary/ serum biomarkers for AKI detection. Dietary sodium and autoimmune diseases...rubbing salt in the wound!! Outside of rheumatology, nephrology and allied branches possibly see the maximum number of patients with autoimmune diseases, particularly with autoimmune etiology being elucidated for a growing number of renal diseases. The current online issue of Nature features a letter by Kleinewietfeld et. al who have worked on the environmental influences acting on the interleukin (IL)-17-producing CD4+ helper T cells (TH17 cells), thought to be pivotal in pathogenesis of autoimmune diseases. Working on the experimental autoimmune encephalomyelitis (EAE), an animal model for multiple sclerosis , the authors have shown that increased salt (sodium chloride, NaCl) concentrations found locally under physiological conditions in vivo markedly boost the induction of murine and human TH17 cells. High-salt conditions activate the p38/MAPK pathway involving nuclear factor of activated T cells 5 (NFAT5) and serum/glucocorticoid-regulated kinase 1 (SGK1) during cytokine-induced TH17 polarization. Gene silencing or chemical inhibition of p38/MAPK, NFAT5 or SGK1 alleviates the high-salt-induced TH17 cell development. The TH17 cells generated under high-salt conditions display a highly pathogenic and stable phenotype characterized by the upregulation of the pro-inflammatory cytokines GM-CSF, TNF-α and IL-2. The authors conclude that high dietary salt intake might represent an environmental risk factor for the development of autoimmune diseases through the induction of pathogenic TH17 cells!! 1. Majority of patients were Hispanics, elderly and presented with chronic renal insufficiency. 2. Proteinuria was absent in about 22.2% of patients at presentation and mean 24 hours urinary protein in the study population was 1 gms (range 0-20 gms). 3. Nephrotic syndrome and microscopic hematuria were seen in about 10.1% and 16.1% cases respectively. 4.Extra renal involvement was rare, seen only in three patients ( duodenal, adrenal & liver). None showed cardiac involvement. 5.LECT2 amyloid shows marked preference for cortical interstitium. 6. False positive staining for SAA (by IHC technique) was seen in three cases and non specific co localization of heavy chains (IgG, IgA, IgM) and light chains (occasionally in a skewed manner) in areas of amyloid deposition was seen in 10.6% cases, leading to a potential misdiagnosis of heavy chain or light & heavy chain amyloidosis. 7. There was high frequency of other co existing primary diseases in about 25% ; most common being diabetic nephropathy and IgA nephropathy. 8. Median renal survival after diagnosis was 62 months. Overall prognosis based on this study appears better for LECT 2 amyloidosis in comparison to reactive or light chain amyloidosis, presumably due to lack of cardiac involvement in LECT 2 amyloidosis. LECT 2 amyloidosis was first described in 2008 by Benson et. al and is now being increasingly recognized as an important cause of renal (Murphy et. al,Larsen et. al ) and hepatic amyloidosis. In light of the available data, nephropathologists should consider the diagnosis of LECT 2 amyloidosis in cases where the amyloid is “non-reactive” with conventionally used markers and, especially, in presence of prominent congophilia with extensive, diffuse interstitial and mesangial involvement in patients who have a minor degree of proteinuria. 2.Serum creatinine increase of more than 50% and100% of baseline values was observed in only five (3.5%) and one (0.7%) patient, respectively. 3. None of the patients developed developed ESRD in the follow up period. After 10, 15, and 20 years of follow up, serum creatinine showed less than 50% increase over baseline in 96.7%,91.9%, and 91.9% of patients respectively. 4.Clinical remission occurred in 53 (37.5%) patients after a median of 48 months. Proteinuria of more than .0.5 and 1.0 g/24 h developed in 21(14.9%) and 6 (4.2%) patients, respectively. Median proteinuria in the study cohort at the end of follow-up was 0.1 g/24 h, with 41 (29.1%) patients having no proteinuria. 5. A significant correlation between the presence of segmental glomerular sclerosis (S1) and both the amount of proteinuria & presence of hypertension at baseline was noted. 1. As the authors have pointed out, the practice of performing biopsies in patients with isolated hematuria and no proteinuria at presentation has been largely abandoned in Europe and US and it is unlikely any further studies would emerge in future analyzing this important aspect of IgA nephropathy, which is known to have a relentless progression in most of previous studies. 2. The excellent clinical outcome in this Caucasian cohort is in sharp contrast to previous studies performed in patients of Asian origin by Lai et.al., Szeto et. al.,Shen P et. al, with similar clinical characteristics. The authors propose that this could be due to the genetic differences between the two populations. 3. Though reassuring, results of this study would make clincial assessment of patients with isolated hematuria more difficult, and definitely call for more work in this area. 4. The application of Oxford classification in biposies of these patients correlated well with the clinical characteristics and outcome, further emphasizing the usefulness of this classification in clincial practice. A very informative editorial by Freda BJ and Braden GL in the same issue discussing this article and providing detailed assessment of previous studies and overview of role genetic factors and regional variations in clinical outcome of IgA nephropathy is also a must read! It is widely agreed that T cells, B cells and antibodies play important role in the alloresponse to renal grafts, and have been subject of several studies. Few investigators have however explored the role of plasma cells, particularly those infiltrating the renal allograft, in assessing the graft outcome. Plasma cell rich acute (T cell mediated) rejection has earlier been recognized as a distinct morphological variant by some authors, with reported prognosis worse than cellular rejections of comparable Banff grades, thus implying that mere presence of significant number of plasma cells may be an adverse factor affecting the graft outcome. In a recent study by Chang et. al. from University of Chicago, 56 consecutive renal transplant biopsies classified by Banff schema into T-cell-mediated (N=21), antibody-mediated (N =18), and mixed (N=17) acute rejection were analyzed using IHC for CD3, CD20, CD138, and CD45.Immunostaining revealed CD3(+) T cells as the dominant cell type, followed by CD20(+) B cells and CD138(+) plasma cells in all acute rejection types. Interestingly, while neither Banff classification nor C4d deposition predicted the return to dialysis, the plasma cell density (and not the T cell density !) significantly predicted graft failure while B-cell density bordered towards significance. Additionally, the eGFR at diagnosis of acute rejection also predicted graft failure, while baseline eGFR ≥6 months prior to biopsy did not. Using multivariate analysis, a model including eGFR at biopsy and plasma cell density was most predictive of graft loss. The authors suggest that plasma cells may be a critical mediator and/or an independent & sensitive marker of acute rejection. Please downoad and read this very informative handout from the RPS companion meeting on renal fibrosis at USCAP 2012 held at Vancouver,Canada in March. 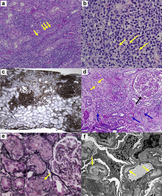 This includes articles on Diagnostic features, pathogenesis, quantification and clinico-pathologic implications of Renal fibrosis (Alton B Farris), Origin, role and activation of renal fibroblasts in fibrosis (Liu), Role of microcirculation in renal fibrosis (B.Sis) and Interactions and impact of inflammation and fibrosis: (Agnes B Fogo). The articles are extensively referenced and provide comprehensive overview of current knowledge in this field. Proteinuria in the post renal transplant period is a vexing problem which can appear in both early and late post transplant periods, and has a variable but definite adverse effect on the eventual graft outcome. In the new issue of Transplant International, Ponticelli C and Graziani G present a nice overview and discuss the extent of the problem, pathogenesis of proteinuria and several important issues in management.The authors suggest that a renal biopsy should be performed in all patients with 24 hour urinary protein excretion of >0.5-1.0 gms in the post transplant period. Readers may take this opportunity to review other important studies on this topic by Reichel et. al, Amer H & Cosio FG, Suarez- Fernandez & Cosio FG, Sabri et. al, Ibis et. al., Knoll GA.
Mesangial IgG co-deposits in IgA nephropathy: do they have clinical relevance? a. Proteinuria at presentation was greater in the IgA-IgG group than the IgA group. b. Capillary wall IgA deposits were noted more frequently in the IgA-IgG group than the IgA group. c. After the start of treatment, urinary abnormalities disappeared earlier in the IgA group than in the IgA-IgG group. d.Cox’s regression model showed that IgG deposition reduced the hazard ratio for CR thus suggesting that IgG deposition was a risk factor for persistent urinary abnormalities and associated with more severe clinical features than cases featuring IgA deposits alone. Though this study has several limitations (retrospective nature, incomplete clincal end points etc. ; several of which authors have themselves pointed out), it serves to draw attention towards meticulous reporting of this finding by Pathologists in biopsies with IgA nephropathy, and also for clinicians to note this finding in biopsy reports and perhaps opt for a more stringent follow up! The August 2012 issue of Kidney International features an elegantly designed intensive study by Cox SN and colleagues investigating the role of altered innante immunity and the CX3CR1-Fractalkine axis in promoting hematuria in patients with IgA nephropathy (IgAN). While micro and episodic macrohematuria are considered hallmarks of disease activity (often co-inciding with concurrent mucosal infections) in IgAN, the mechanisms of hematuria are still obscure. In the present study (encompassing a robust study population of 79 patients with IgAN), authors initially performed a whole genomic screen (using microarrays) of peripheral blood mononuclear cells (PMC's) in three randomly selected IgAN patients during episodes of gross hematuria and then during the remission phase. From the data that emerged, bio informatic and Ingenuity pathway analysis (IPA) demonstrated that the identified genes were involved in interferon signaling, antigen presentation, and cytotoxic T lymphocyte–mediated apoptosis of target cell pathways.The network showed involvement of the immunoproteasome pathway (e.g.,PSMB8, PSMB9, and PSMB10), the central role of interferon signaling (e.g.,STAT1), and the presence of a gene characterizing cytotoxic effector lymphocytes CX3CR1. The authors demonstrated upregulation of CX3CR1 in PMC's of an independent set of IgAN patients (at two time points as above) using the Western blotting and flow cytometric approaches.They further demonstrated expresssion of Fractalkine (the ligand for CX3CR1) in glomerular podocytes and endothelial cells (using immunohistochemistry and immunofluoroscence) and high levels of urinary Fractalkine particularly in cases with gross hematuria. Also worth reading is the editorial by Frank Eitner and Jürgen Floege in the same issue, discussing this study and beautifully pointing out the lacunae we still encounter in this rapidly progressing field. A truly stimulating experience and must read for all! 1. Clinical History, 2. Gross description of the sample, 3. Microscopic features including the Light microscopy (enumerating the special or immunohistochemical stains used) and glomerular,tubulointerstitial & vascular alterations, 4. Immunofluoroscence microscopy including the description of localization and intensity of various antibodies and any additional features including presence of any sclerosis, necrosis, etc. identifiable in thse sections, which may supplement the light microscopy findings. 5. Electron microscopic features, 6. Final Diagnosis (or diagnoses) and 7. Diagnostic comment. A previous, widely cited publication by the ad hoc committee of RPS (Walker et. al) mainly concerned the guidelines for collection and processing of the renal biopsies. For those who have not come across this earlier, please download and read this amazingly informative write up by Weening JJ and Jenette CJ, published earlier this year in Virchows Archives, detailing the origin and development of renal pathology as a speciality in its own right. An series of extremely informative, freely accessible articles providing an exhaustive and in depth review of cardiorenal syndromes , covering each subtype in great detail along with several other related articles were published in a recent issue of Seminars in Nephrology. A must read for all!! Role of complement factor H in renal diseases is a well known and extensively researched topic. Three recent articles highlighting the complexity of genetic and morphological alterations associated with abnormalities of complement factor H and its related proteins have appeared. 1. In a paper published in Kidney International by Sethi, Frevenza, Zhang et. al. a detailed and fascinating account of clinicopathological findings, complement abnormalities, glomerular proteomic profile (from laser microdissection and mass spectrometric analysis), treatment, and follow-up of 12 cases with C3 glomerulonephritis is presented. 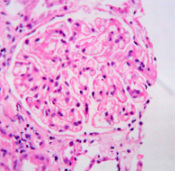 Renal biopsy mainly showed a membranoproliferative glomerulonephritis (MPGN) pattern, and less commonly mesangial proliferative and diffuse endocapillary proliferative GN . Several acquired and genetic abnormalities of the alternate complement pathway were also observed: commonest being presence of C3 nephritic factor (C3NeF), and occurence of H402 and V62 alleles of Factor H. Other abnormalities including Factor H autoantibodies and mutations in CFH, CFI, and CFHR genes were noted. 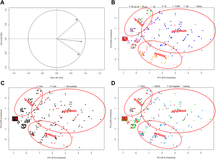 The authors also performed laser dissection and mass spectrometry of glomeruli from patients with C3GN, which revealed accumulation of alternate pathway and and terminal complement complex proteins. 2. Malik et. al (JASN),report an autosomal dominant complement-mediated GN associated with abnormal, increases in copy number across the CFHR3 and CFHR1 gene loci in eight affected individuals (over three generations) among a large kindred with familial complement mediated glomerulonephritis. The authors describe a novel CFHR3–1 hybrid gene located on an allele that also contained intact copies of the CFHR1 and CFHR3 genes. Renal biopsies were perfromed in six of the eight patients and revealed MPGN type III pattern injury, with exclusive deposition of C3 in glomeruli and absence of immunoglobulins. Notably, there was no evidence of anti-factor H autoantibodies or C3 nephritic factors, and plasma C3 and Complement factor H levels were normal. The authors have observed that association between an abnormal CFHR3–1 hybrid gene on an allele with intact copies of both CFHR3 and CFHR1 in familial C3 glomerulopathy,together with the recent observations that deletion of CFHR3–1 is common among healthy individuals and protects against IgA nephropathy and Age related macular degeneration (AMD), suggest that CFHR3–1 protein causes C3 glomerulopathy through a dominant mechanism. capillary wall injury. Evaluation of the alternative complement pathway showed a novel polymorphism in short consensus repeat (SCR) 12 of complement factor H (CFH; c.2195C>T, p.Thr732Met) and a polymorphism in complement factor C3 (c.463A>C, p.Lys155Gln).This case also highlights the expanding spectrum of complement-mediated glomerular diseases and shows that FSGS with features of capillary wall injury should prompt evaluation for abnormalities in the alternative complement pathway. Use of C4d as a marker of classical complement pathway activation and hallmark of antibody mediated rejection in allografts is widely acknowledged. In recent years, use of C4d in situations other than allograft pathology has also been described. In the recent issue of Revista Nefrologia, Espinosa-Hernández et. al have described C4d staining as useful adjunct in diagnosis of Membranous glomerulopathy (MGN). The authors included 21 cases of MGN and 19 cases of Minimal Change Disease (MCD) as controls, and detected specific granular staining for C4d along glomerular capillaries in all the cases of MGN, and in none of the biopsies of MCD. They conclude that C4d is a component of immune complexes in MGN and C4d staining can be used as adjunct in diagnosis of MGN, particularly in cases of early MGN (with minimal histologic abnormalities) where tissue for DIF studies is either not available or does not contain glomeruli. Earlier J. Fernando Val-Bernal et. al from Spain and Kusinoki et. al. from Japan have published similar results in their study populations. A growing body of literature is now emerging regarding use of C4d in other disease conditions as well. These include lupus nephritis, particularly as a marker of TMA in these patients. Another study of C4d in SLE (Lim and Jeong, Korea) concluded that while C4d deposition is an indicator of classical complement pathway activation in lupus nephritis, it does not correlate with disease activity. Few recent studies have investigated the utility of C4d staining in feto maternal pathology associated with anti phospholipid antibody syndrome, where complement activation via the classical pathway is involved in disease pathogenesis. A recent article in JASN from authors at Columbia and Harvard Universities decribes the interesting renal pathology in post treatment biopsies of patients receiving Eculizumab for Dense Deposit Disease (DDD) and C3 glomerulopathy(C3GN). In an open label, non blinded, proof of concept, efficacy and safety study of Eculizumab, six patients (three with DDD and three with C3GN), who had a renal biopsy performed within 6 months of enrollment and presented with proteinuria or acute renal failure were included. After uniform treatment with Eculizumab for one year, repeat renal biopsies were performed (in five patients who consented). Among the six patients, three showed clinical improvement, two of these also showed histological improvement while one other patient with clinical improvement showed no significant change in histology from pre-treatment biopsy. DIF studies interestingly revealed persistence of C3 and C5b-9 (posssibly due to its long half life). Authors also stained normal renal biopsies for C5b-9 which showed mild to moderate staining in glomerular mesangium, few capillary walls, Bowman's capsule, tubular basement membranes (TBM's) and arterial & arteriolar walls, indicating physiological activation and deposition of C5b-9 in normal renal parenchyma. The authors suggest that this might be the reason why deposits tend to form in glomeruli and TBM's in patients with disorders of complement regulatory pathways. The most interesting finding was the deposition of monoclonal IgG with kappa restriction in glomeruli, tubular basement membranes and vessels (mimicking MIDD), and showing staining only for IgG2 and IgG4 subclasses; properties identical to humanized Eculizumab!, thereby indicating deposition of the drug itself at this location (recall that biopsies with DDD and C3GN have almost exclusive staining for C3).This is a fairly convincing demonstration of an apparent drug-tissue interaction, whose long term effects & implications are yet unknown but may ignite a spark in minds of scientists working on drug delivery to individual renal compartments! refractory complement mediated MPGN . Pericytes (Rouget cells or mural cells) , described more than 125 years ago, are versatile cells located in close proximity to the microvasculature, lying abluminally in all vascular capillaries and post capillary venules. Role of pericytes in renal diseases and physiological processes has long been neglected , however last few years have seen a series of publications on this topic, particularly concerning their role in renal fibrogenesis. An exhaustive review published in recent issue of NDT by Smith, Chand & Savage is an excellent resource of information on this topic and discusses in detail the role of these enigmatic cells in vessel development, maturation and stability & renal fibrosis along with a discussion on targeting the endothelial cell-pericyte cross talk in treatment of renal fibrosis. Few other articles related to morphology & properties of pericytes and other functions should also be read for thorough understanding of the physiological and pathological role of these cells. and a history of two previous hyperacute antibody mediated allograft rejections (within 12 hours) in live donor transplants. A third transplant performed after administration of plasmapheresis (PP), intravenous immunoglobulin (IVIg) treatment, anti-CD25, and anti-CD20 antibodies functioned immediately but became anuric within 24 hrs. A biopsy revealed antibody-mediated injury in the absence of C4d. A retrospective endothelial cell crossmatch (ECXM) was positive with serum drawn 3 days prior to transplant and these EC antibodies were enriched for IgG2 and IgG4, noncomplement activating subclasses. Postoperative day (POD) 3, HLA-DSA remained negative but a rescue splenectomy was performed. Cultured splenocytes produced antibodies that bound donorendothelial cells but not lymphocytes. Allograft function failed to recover even after aggressive therapy. The role of non HLA antibodies in allograft rejection has been suspected for long however lack of standardized screening assays have hampered the development of antibody panels most relevant to pre transplantation testing.Antibodies to various non HLA targets including endothelial cells,vimentin, peroxisomal-trans-2-enoyl-coA-reductase, have ben associated with adverse allograft outcome.A recent unique study published in PNAS ,employing the transcriptome and "antibodyome" measures to identify renal compartment specific non HLA targets and other developments have raised the hope that routine pre transplantation testing for non HLA targets would soon become a reality, and possibly go a long way in improving short and long term allograft survival rates. Since the discovery of Th17 subtype of CD4+ T cells, extensive insights into the biological role and functions of Interleukin 17 (IL 17) have been gained. IL-17 (or IL-17A) is the founding member of the IL-17 cytokine family and is involved in the induction and mediation of several proinflammatory processes by triggering the expression of many other cytokines such as IL-6 and TNF . In addition to the Th 17 CD4+ T cells, IL 17 is produced by several other hematopoeitic cell types including NK T17 cells,Tc17, NK p46+ cells, Macrophages, Dendritic cells, Paneth cells, Neutrophils and Eosinophils. In context of ANCA associated renal disease, few earlier observations suggested that MPO -ANCA induces IL-17 production by activated neutrophils,via classical complement pathway-dependent manner.However, the exact cellular source of IL 17 in ANCA assoicated glomerulonephritis remained an enigma. To address this issue, Velden et. al in a recent study published in American Journal of Physiology-Renal Physiology have studied the expression of IL 17 in renal biopsies with ANCA associated necrotizing and crescntic glomerulonephritis using a monoclonal antibody against IL 17. The authors detected numerous IL-17-expressing (IL-17+) cells in the glomeruli and tubulointerstitium, most of these being IL-17+ polymorphonuclear neutrophilic granulocytes, with significantly lower numbers of IL-17+ T cells and IL-17+ mast cells. 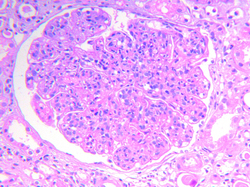 IL-17 was not detected in other infiltrating or resident kidney cells. In the treatment naive patients (those who did not receive immunosuppressive treatment before biopsy), serum creatinine levels were positively correlated with tubulointerstitial IL-17+ neutrophils as well as IL-17+ T cells. As a further proof of their findings, authors have demonstrated that purified human blood neutrophils expressed IL-17 protein and released it upon stimulation in vitro. These results not only support the previously investigated role for IL-17 in human ANCA-associated glomerulonephritis but also suggest that neutrophils may act as an important early innate source of IL-17, particularly in early phases of the disease , raising the hope that IL-17 may be an important potential target for treating acute ANCA-associated glomerulonephritis. Transglutaminase 2 andIgA nephropathy.....the riddle solved? The article has also attracted an editorial published in Science Translational Medicine, where Dr. Obheroi has aptly described this discovery as " Connecting the Dots to Describe a Mechanism for IgA Nephropathy"
applied in amyloid plaques in brain and nerve tissue. Though facilities for LCM and MS are still not available at many institutes, it is hoped that every country wouldeventually develop at least one centre where referral material can be sent for accurate typing of amyloidosis! chronic/active AMR. In addition,role of C4d in other conditions including systemic autoimmune diseases and pregnancy is also discussed.This review provides an overview of the past, present, and future perspectives of C4d as a biomarker, focusing on its use in solid organ transplantation. A must read for all nephrologists and nephropathologists. nephrotic syndrome characterized by accumulation of atypical Type III collagen fibrils in the mesangial matrix and glomerular subendothelial spaces and elevated serum levels of procollagen III peptide . This disease exhibits indolent progression and has no specific treatment as yet. A recent article by Duggal et al published in Clinical Kidney Journal descibes three new cases and presents an excellent overview of the disease. The cases described in this report as well as majority of previously reported cases/reviews (Yasuda, Alchi, Tamura, Yoshida, Khubchandani , Imbasciati , Gubler, Ferreira) describe the glomerular involvement manifesting as lobular accentuation, variable thickening of capillaries and a membranoproliferative/mesangiocapillary pattern. This along with absence of immune complexes in DIF studies brings various other entities including chronic TMA in the differential diagnosis. A careful morphologic analysis, correct clinical setting and ultrastructural demonstration of abnormally oriented collagen fibrils with a periodicity of about 60 nm clinch the diagnosis. The distribution of these collagen fibrils (and the clinical presentation) separate this entity from nail-patella syndrome, where the abnormal collagen accumulates predominantly in lamina densa of the GBM. The findings in article by Duggal et.al. re-emphasize the fact that collagenofibrotic glomerulopathy should be considered in the setting of a mesangiocapillary/membranoproliferative injury pattern, particularly in absence of demonstrable immune deposits. There is limited experience on transplantation in patients with this disease, however occasional reports suggest a favorable outcome.A case of collagenofibrotic glomerulopathy in virtual microscopy format can be viewed here. category were seen more frequently in public sector hospitals. These patients were significantly younger (p<0.0001) and more frequently presented for the first time in stage V CKD (p<0.0001). In terms of diagnostic categories, patients with CKD of undetermined etiology were more likely seen in public sector hospitals whereas hypertensive nephrosclerosis was more frequently seen in private hospitals (p<0.0001). Importantly, the proportion of patients with diabetic nephropathy was similar in both the groups. activity. Interestingly there was no effect on acute allograft rejection by SHS. This study has strengthened and lended further credibility to observations linking smoking to reduced allograft survival and chronic allograft damage. The seminal article describing the human antigen presenting cells that express indoleamine 2, 3-dioxygenase (IDO) was published in Science in 2002. An excellent review on the role of indoleamine 2,3-dioxygenase in transplantation by Hainz et. al was published some time back in Transplant International and should be read for better understanding of this important biomolecule. In spite of years of intensive research, it has been a largely unfulfiled dream of many researchers to deliver desired therapeutic agents in specific renal compartments. A recent article in Clinical and Experimental Nephrology, by Sato A et. al. from Japan reports a unique method of blocking local renin angiotensin activity in a in a progressive experimental model of anti-Thy-1 glomerulonephritis by sub capsular implantation of a collagen sponge containing aliskiren, a direct renin inhibitor.The authors evaluated the pharmacological effect by semiquantitative and quantitative analysis of immunohistological findings and analysing the glomerular microcirculation using intravital microscopy. It was observed that local treatment with aliskiren significantly suppressed mesangial matrix expansion, reduced the glomerular sclerotic index and markedly increased the glomerular blood flow. Several other approaches aimed at targeted renal drug delivery are being developed which include use of immunoliposomes, microbubbles and ultrasound, low molecular weight proteins and nanoparticle mediated drug delivery utilizing the gold and chitosan nanoparticles among others. Though many of these approaches are still at experimental level, few, particularly the Liposomal methodology has been used in clinical trials for various malignant neoplasms with documented success; raising the hope that applications in medical renal diseases would not be too far behind! Urinary biomarkers for glomerular diseases.........where are we? Current issue of JASN features a brilliant study from Iwano M et. al from Japan describing the utility of FSP 1 (fibroblast specific Protein-1) as a potential biomarker of glomerular crescent formation. The authors developed two monoclonal antibodies for FSP1 and also devised a method for estimating urinary levels of FSP1 using a sandwich ELISA technique. The biomarker was then evaluated in 147 patients with various biopsy proven glomerular diseases including ANCA glomerulonephritis, FSGS, IgA nephropathy, Lupus nephritis, MCD and Membranous nephropathy, in addition to controls. Patients were segregated in two groups: those with crescents in 20% or more glomeruli and others (with less than 20% crescents) and it was seen that urinary excretion of FSP 1 was significantly higher in patients with 20% or more crescents. Importantly, the urinary FSP levels showed a decline after successful treatment of the glomerular activity, further strengthening the clinical utility of this biomarker. Using immunohistochemistry and dual immunofluoroscence techniques, authors also prove that FSP1+ glomerular cells are the major source of urinary FSP1. Studies aimed at biomarker discovery for various glomerular diseases have been performed with variable results. Advances in proteomics and other techniques have led to voluminous biomarker related research in several glomerular (and tubulointerstitial) diseases including lupus nephritis, IgA nephropathy (KIM1,NGAL,IL 6), ANCA disease, FSGS. Ohlsson, Thongboonkerd,Nickolas, Tesch, Fassett, Hewitt, Konvalinka. The histological features that may predict the outcome of patients with diabetic nephropathy have been evaluated in several studies , ,,  with varying conclusions. While it is generally agreed that both glomerular and tubulointerstitial lesions contribute to disease progression, the relative contribution of these factors remains a topic of research and debate. Earlier studies on this topic suffered from a lack of denominator, considering there was no unified system or consensus classification for glomerular or tubulointerstitial lesions in diabetic nephropathy. This issue was taken up by the research committee of Renal Pathology Society,and a multi institutional study culminated in the proposed pathologic classification of diabetic nephropathy (Tervaert et. al), published in JASN in 2010. Following this up, Okada et. al from Tokyo university, Japan have investigated the histological predictors of renal prognosis in type -2 diabetics with overt proteinuria and published their results in recent issue of Nephrology.Their study included 69 consecutively diagnosed patients of type 2 diabetes mellitus with biopsy proven diabetic nephropathy and overt proteinuria. The histological lesions were classified as per the proposed classification and patients followed up for a median of 52 months. Cox proportional hazard analysis showed that the glomerular classes were not significant variables, while interstitial fibrosis, tubular atrophy and interstitial inflammation were independent predictors of renal prognosis. Additionally there were no differences in renal survival rates among patients with combined class 2a& 2b and class 3 group. This study concludes that tubulointerstitial and not glomerular lesions are predictors of renal prognosis. This paper is important from two aspects; firstly it is among the few early studies based on the proposed classification of diabetic nephropathy with clearly stated clinical outcomes, and secondly, it challenges the concept of glomerular lesions as dominant factors for disease progression (the very basis of the proposed classification!). It will be interesting to see more studies on this topic, which will definitely affect the final format of proposed classification, which is currently undergoing validation studies. This was the title of a news article in "The Washington Post" in August 1986, describing the diagnosis of breast carcinoma in frozen sections at a centre in Washington using a remotely controlled robotic microscope, on images received from a hospital in Texas; representing the proof of concept of "telepathology" . In the 25 years since then, phenomenal advances have been made in digital technology and imaging systems, enabling high resolution scanning, transmission and archiving of digital images, with possible use in diagnosis, research and teaching. Reports of systematic applications of this tool in renal pathology have been few. In a recent study by Ozluk Y, eleven histopathological lesions were scored and used to construct diagnosis according to Banff criteria using both glass slides analysis and digitally scanned whole slide images.The inter-observer reproducibility of Banff scores was better in virtual slides than in glass slides (mean κ: 0.42 vs. 0.28, p<0.001). Among the lesions, transplant glomerulopathy scoring by virtual slides showed the highest inter-observer reproducibility. The authors concluded that virtual microscopy is a reliable and more reproducible technology compared to glass slides and could even be used for clinical trials. The recent survey for proposed polyoma virus nephropathy classification is another example of application of this strong tool in nephropathology. Earlier, P Furness from Leicester had compared the diagnostic accuracy of internet-based virtual microscopy with light microscopy, in renal biopsies assessed by participants in the UK National Renal Pathology External Quality Assessment (EQA) Scheme, and found encouraging results. An internet search for terms with "telepathology" or "virtual pathology" yields a bewildering array of information, a sure indicator of the times to come! Readers are linked to few informative articles by Hitchcock, Leong, Hipp (Image Microarrays) , Kaplan, Lele, & Foster . We do hope to include some applications of this technology in nephro-pathology.com also....... Keep posted!! In the recent issue of Transplantation proceedings , Choi SR et. al. from Seoul, Korea report their experience with renal biopsies performed in donors with asymptomatic urinary abnormalities and follow up data on transplanted kidneys from these donors. Fifteen donors were detected with urinary abnormalities, including fourteen with persistent microscopic hematuria, who were biopsied and revealed Thin Basement Membrane Disease (TBMD) in seven, non specific findings in four , IgA nephropathy in two and FSGS in one donor. Nine of these were accepted for transplantation and showed a favorable outcome over a follow up period of 34.7 +/- 42.5 months. This issue has been a topic of concern, particulary with the increasing burdern of patients listed for renal transplantation and donor crunch.Previously Vadivel N and colleagues from Boston and Koushik et. al have published their experience and proposed few guidelines /algorithms for systematic workup of such donors. The outcomes in transplants with IgA nephropathy and thin basement membrane disease are currently unclear and a careful work up of these patients is warranted, particularly in view of several collagen type IV abnormalities seen in patients with TBMD. An interesting study by Moreno JA and colleagues published in cJASN reviews the clinical and pathophysiologic consequences of glomerular hematuria associated acute kidney injury (AKI). Earlier the presence of glomerular hematuria per se was not considered to be a harbinger of adverse prognosis, however the authors have extended their previous work on this subject and suggest that macroscopic hematuria associated/induced AKI is related to adverse long term outcome. In their study almost 25% of patients with IgA nephropathy presenting with glomerular hematuria and AKI did not recover baseline renal functions. Histologically the AKI manifests as acute tubular injury and red blood cell casts which may induce tubular damage by mechanical obstruction and also through toxicity of heme (direct toxicity, induction of oxidative stress and chronic toxicity through induction of inflammation and fibrosis). They suggest that since no specific therapies are available at present, early steroid administration to accelerate recovery and prevent chronic damage may be performed,based on obervational studies. Same group of authors have also published an editorial in NDT, emphasizing the role and significance of hematuria induced renal damage in development of CKD. Nanotechnology and nanomedicine are among the most sought after fields in investigative physical, chemical and biomedical sciences. The applications of this exciting technology in renal diseases have been viewed with caution, particularly the aspects of nanotoxicity, of which the kidneys may bear a significant brunt. In the recent issue of Kidney International Sargsyan et. al. have reported the successful use of superparamagnetic iron oxide nanoparticles conjugated to complement receptor type 2 as targeting agent to detect the glomerular deposition of C3 fragments through Magnetic Resonance Imaging (MRI) in a murine model of lupus nephritis. Authors propose that this might transform into a unique method of non invasive monitoring of disease activity in glomerulonephritis, should this become feasible in humans. Though a modest study, it has further widened an exciting window for research in nanonephrology.The future definitely holds promise in fields of nanoparticle mediated drug formulations, drug delivery and several possible applications of nanotechnology in refining the dialysis techniques! Readers are referred to an excellent review on current status and future of nanomedicine by Moghimi, Hunter and Murray, and the exhaustive site on Nanomedicine by Robert A Freitas Jr. I am sure this is topic close to many a researchers and students heart alike! Among the various "biases" that directly or indirectly affect the quality, content and visibility of biomedical research, the FUTON (Full Text On Net) bias is perhaps the most relevent. This post is prompted by a manuscript i was reviewing recently. The authors had completely missed out on data from a few important large studies relevent to the paper, and on probing it turned out that full text of these articles was on not available online. urging the publishers to provide more full text online, and publishing internet only versions of articles. Though some efforts have been made since then,including the concept of open accessand the HINARI programme of WHO,a significant number of students, researchers and practitioners are still crippled by non-access of important scientific literature and prohibitive costs of pay per article access. Worth mentioning here are few more "biases" including theNAA (No Abstract Available) bias, language bias and publication bias. Readers are referred to few important articles in this regard by McGauran, Chavalarias, and Song et. al. Comments on this topic and any suggestions for remedies are invited! 1. TMA in IgA nephropathy is common and perhaps underrecognized. 2. TMA in this group may occur early in the course of disease and even in patients with normal/controlled blood pressure; implicating mechanisms other than malignant hypertension also involved in pathogenesis. 3. TMA is associated with a worse renal prognosis. Interestingly regression analysis and Cox proportional hazards modeling of outcome sorted laboratory evidence of TMA as significant factor in eGFR decline and poor clinical outcome, however the mere histologic evidence of TMA did not sort as significant; a phenomenon authors describe as the "tip of the iceberg effect". Notably, the same group of researchers had earlier published their data on the occurence and significance of focal and segmental glomerular sclerosis in IgA nephropathy in two excellent articles concerning the immunohistochemical studies and light microscopic and clinical features. Borderline category of TCMR has raised concerns (and eyebrows at times!) mostly from clinicians, as it does little to guide a specific or logical therapy. This entity has however managed to find a place in every Banff update since its introduction in 1991. Current issue of American Journal of Transplantation features an important study by Prof.Phil Halloran's group at Edmonton. The authors compared molecular features (T-cell burden; a rejection classifier; a canonical TCMR classifier; and risk score) in biopsies with histologically diagnosed borderline changes ,TCMR and non rejection cases using microarrays, and were able to reclassify the borderline biopsies in two discrete groups: "the TCMR like" and "non-rejection like". About 67% of the biopsies with a borderline diagnosis on histology were reclassified as "non-rejection like" using the molecular analysis. The authors probe the prospects of eliminating the borderline rejection category. In the same issue a very interesting editorial by Prof. Randhawa is also featured, which presents the pathologists perspective on the article and discusses the important aspects of inherent sampling effects/errors and few very critical issues that will guide future modifications of the Banff schema. Idiopathic Membranous Nephropathy...........within striking distance! These are exciting times for research and targeted therapy development in Idiopathic Membranous Nephropathy. Years of tireless work by researchers across the globe has led to identification of few specific antigenic targets (autoantigens), paving way for possible development of diagnostic tests and targeted therapy. Beginning with report of anti neutral endopeptidase antibodies in an infant with severe Membranous nephropathy born to a mother deficient in neutral endopeptidase, by Debeiec et. al in NEJM , and the landmark paper of Beck et. al describing the Phospholipase A2 (PLA2) receptor as antigenic target in idiopathic MGN, few other antigenic targets including manganese superoxide dismutase, aldose reductase and alpha enolase have recently been identified. Few excellent review articles describing the developments and application of basic research to practice in this area by Murtas et. al ,Ronco and an informative article on podocyte antigens should be read for a clearer understanding of developments in this area. An immunofluoroscence test for anti phospholipase A2 receptor antibodies has been developed (though not validated), and we hope that in this year crucial aims like targeted therapy trial and validated tests for screening PLA2 receptor antibodies are achieved! An interesting study, involving mainly nephrologists with varying levels of experience, was published in the journal Renal failure some time back, which evaluated the utility and user satisfation of web based nephropathology teaching tools .The authors created a web site http://blog.ecu.edu/sites/nephrologyondemand/?page_id=4502 which provided nephropathologic specimens with explanations. Users were asked to complete a Likert-based survey (1-strongly agree . . . 5-strongly disagree) regarding four key areas of content quality: accuracy, currency, objectivity, and usefulness. Learners of all training levels perceived the content quality favorably. Authors concluded that The Nephrology On-Demand Histopathology is a useful teaching tool to learners of all training levels. Educators may consider using it, as well as other online nephropathology sites, as adjunctive teaching tools. Not many exhaustive nephropathology teaching sites exist and it will be interesting to see the applications of this strong tool as an adjunct in training of renal pathology, particularly in resource poor settings! IgG4 related disorders are among the recently described diseases characterized by high serum levels of IgG4 and infiltration of IgG4 positive cells in various organs, including kidneys. Renal involvement usually ocurs in the form of a sharply delimited focus of tubulointerstitial nephritis. A Japanese group has recently published the proposed criteria for diagnosis of renal involvement in Clinical and Experimental Nephrology. The authors have proposed a diagnostic algorithm , which is admittedly exhaustive but a welcome step in better and more uniform characterization of this important disease entity. The subclassification of diffuse lupus nephritis (Class IV) into segmental and global subclasses was a major revision in the 2003 ISN/RPS histological classification of lupus nephritis, and has been a topic of debate eversince. A study published in the current issue of JASN describes the results of a meta-analysis from the group at Nijmegen Medical Center, The Netherlands. The results of meta-analysis do not support a significant difference in renal outcome between the segmental (IV-S) and global (IV-G) subclasses (relative risk for class IV-G versus IV-S, 1.08; 95% confidence interval, 0.68–1.70). Meta-regression did not suggest that ethnicity or duration of follow-up influenced the association between histologic class and renal risk. The authors conclude that rate of doubling of serum creatinine or of ESRD did not differ between patients with class IV-S and those with IV-G lupus nephritis. These results may cast a serious doubt on validity of this subclassification which surely will be under tough scanner at the time of next revision! Treatment of ANCA associated renal disease with Rituximab has been a recent topic of debate and few multi-institutional studies (Stone et. al., Jones et. al).Efficacy of Rituximab based treatment protocols is yet to be proven , however after FDA approval several centres are offering this therapy to patients, particularly those with severe or cyclophosphamide resistant disease course. There is limited experience with histopathological changes in ANCA associated renal disease in patients treated with Rituximab compared to those on cyclophosphamide therapy . A recent article in JASN by authors at the Leiden university describes associations between renal histopathology and outcomes among patients treated with a rituximab-based regimen in the Randomized trial of Rituximab versus Cyclophosphamide in ANCA-Associated Vasculitis. In a multiple linear regression model, authors found that both CD3+ T cell tubulitis and tubular atrophy independently associated with estimated GFR at 12 months and tubular atrophy remained an independent predictor at 24 months. Authors suggest that in addition to anti–B cell therapy (Rituximab), treatment directed at T cells may improve renal outcomes in ANCA associated vasculitis. Readers are referred to two excellent articles on the role of Rituximab in renal diseases and transplantation. Wikipedia describes Renal pathology as "a subspecialty of anatomic pathology that deals with the diagnosis and characterization of medical diseases (non-tumor) of the kidneys." It is among those branches of Pathology where the interaction beween clinician (nephrologist) and pathologist is far more intense and forthcoming. The gamut of this fascinating branch is witfully described by one of my mentors; in his words " an accurate diagnosis rendered by a renal pathologist comprises of knowledge of following ingredients or constituents : 40% "pure science", 20% Clinical Nephrology, 20% pathophysiology and 20% morphology" ; this is where renal pathology differs from other branches of anatomic pathology. A nephropathologist reading a slide looks not only at the morphology, but also incorporates a significant amount of pathophysiological, investigative and clinical knowledge in the final opinion.